Galwegians suffered more heartbreak with a 5-7 defeat to Navan at a blustery Crowley Park on Saturday. A game they should have won, luck was not on their side, with the bounce of the ball and some key decisions going against them at crucials moments which denied them what could have proved a n important victory. The visitors, riding high in third place, were heavily fancied to inflict another defeat, but the Blues, playing with the aid of a swirling breeze, dominated both territory and possession. After outhalf Dave Clarke was off target with a kickable 25m penalty, they hit the front on 25 minutes with a well-worked try. The pack laid the platform before good handling by the backs provided right-wing Sean O’Sullivan with some space down the right. The young winger evaded a last-ditch tackle to dot down in the corner, and Clarke was desperately unlucky when his conversion rebounded off the post, leaving it 5-0 to the home side. The visitors eventually began to settle with their burly pack getting the better of Galwegians, who started to concede penalties. Eventually on 35 minutes referee Ken Imbusch sin-binned Wegians. No 8 Matt Towey for the latest infringement at a maul, and just 30 seconds later fellow backrow Paul Hackett was binned, a decision which seemed harsh. However Navan was unable to capitalise, thanks to some dogged defence, hugely impressive relieving run by debutant lock Terry Abayoni after the break, and their failure to convert possession into points. The home side then came close to increasing after an impressive maul led to a five-metre scrum. Frustratingly for the home side, they were penalised for an early engagement, allowing the visitors to take control for the final 10 minutes. Tremendous defence looked like keeping Navan at bay, but referee Imbusch issued a third yellow card when scrumhalf Barry Lee was binned for offside. 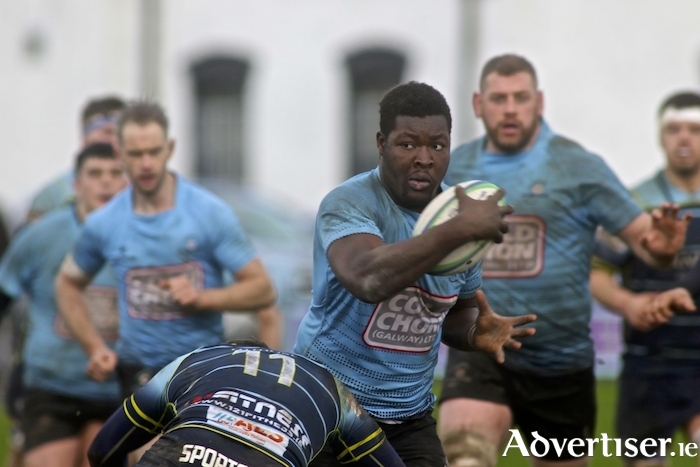 Eventually Navan made their numerical advantage pay when fullback Fox crossed the whitewash for their first score of the game in the 75th minute, and scrumhalf Brian Haugh added the extras to nudge his side ahead. The 14-man Wegians showed incredible heart to mount one final assault, and a super break from veteran centre Brian Murphy sent O’Sullivan clear on the 22. The winger looked certain to make the line only for a desperate try-saving tackle by McEntaggart in the 82nd minute to deny him at the corner-flag. So no consolation to the Blues, who now have a three-week break before the arrival of runaway league leaders Highfield . Galwegians XV: Ewan Strang, Sean O’Sullivan, Brian Murphy, Tommy Downes, Daniel Faulkner, Dave Clarke, Barry Lee, Pa Curran, Christy Reilly, Fiachra Finnegan, Abdulhaq Afalobi,Anthony Ryan (capt ), Michael O’Donnell, Paul Hackett, Matt Towey. Subs: Kurtis Kyne, Andrew Paton, Kieran Downey,J ames Kennedy, Mohi Parata.